U.S.A. $4.00 a year; Foreign $4.50. Subscriptions run for calendar year in which placed. Continuing subscriptions available. Please make cheques payable to MMN, The Rosenbach Foundation. 2010 DeLancey Place, Philadelphia, Pennsylvania, 19103. For the scholar who seeks to understand MM's poetry at levels beyond the perifery, the Marianne Moore Collection at the Rosenbach Foundation yields an extraordinary number of clues. While MM pointed out many of her references in her notes, by far the greater number of allusions, quotations, and sources of images remain to be explored. In some cases, the original source material has become so transformed by the poet that it comes to light only through serendipity while one works through the collection. One such discovery concerns MM's last magazine appearance. A small color reproduction of Rene Magritte's painting "Domain of Lights" from the New York Times Magazine (19 January 1969, p. 69) and an article from Arts Magazine (42, Dec./Jan., 1967/68) were found among MM's clippings. MM wrote "The Magician's Retreat" above the Magritte picture which portrays a house among dark trees, lit by a lamppost, all set against a bright sky. The Arts Magazine article concerns "Visionary Architects Of the 18th Century" with a cover illustration of a house designed by Jean-Jacques Lequeu and named "The Magician's Retreat" in its identification ("Repaire des Magiciens" appears indistinctly on the drawing). As MM's readers will know, both clippings relate to her poem in the New Yorker (45, 21 February 1970, 40). But without them, while one might recognize Magritte’s painting in the poem, one would not discover Lequeu’s drawing as the source of the title. With the clippings, however, Magritte’s surrealist work joins Lequcu's surrealist architectural drawing, which in its turn extends the dimensions of the poem through allusion to the 18th century work. Rene Magritte, "Domain of Lights," 1953-54. Oil on canvas. Lent by the Peggy Guggenneim foundation. The Solomon R. Guggenheim Museum. in this instance the title of one work applied to a description of the other, only the materials conserved by the poet herself make possible an understanding of the poem deeper than guesswork or speculation can provide. Reprinted by permission;©1970. The New Yorker Magazine, Inc.
Jean-Jacques Lequeu (1757-1825), an ink and wash drawing, "The Magician's Retreat," reprinted with permission from the cover of Arts Magazine for December/ January, 1967-1968. MM saved the cover, title page, and related article from this issue. The drawing was exhibited at the University of St. Thomas, Houston, its first appearance in the Western Hemisphere, on loan from the Bibliotheque Nationale, Paris. In reply to a query about her poem, "The Steeple-Jack, MM told Barbara Kurz, a poet, that Brooklyn and New England were settings for the poem. The Lafayette Avenue Presbyterian Church, in Brooklyn Heights, is the church MM attended during her years at 260 Cumberland Street. The Lafayette Avenue Presbyterian Church as it looked in 1912. The steeple was removed in 1932 when subway construction undermined its safety. The earliest yet discovered in print "contribution” by Marianne Moore, aged 7, appears in the preface to Sermons by the Rev. John R. Warner, D.D. 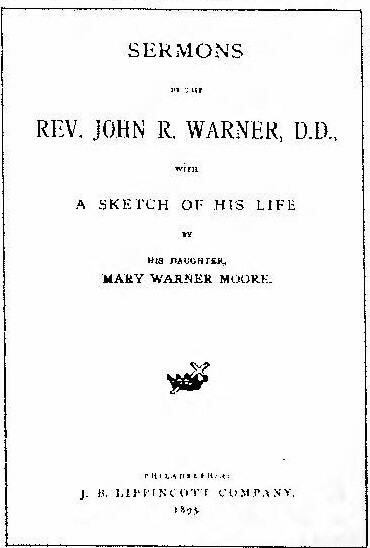 , with a sketch of his life by his daughter, Mary Warner Moore, Philadelphia, J. B. Lippincott, 1895. Rev. Warner, MM's grandfather at whose home in Kirkwood, Missouri, she was born, had died suddenly of pneumonia on February 20, 1894, By the following August, Mrs. Moore had confided to her cousin, Mary Shoemaker (in a letter now at the Rosenbach Foundation) that she was "trying to get some of Pa's sermons ready for printing.” By October she was working on the preface, "but when I think of my dear father's beautiful life,I mourn that there is no tongue that can tell it to others.” Her Uncle Henry, Rev. Warner's brother, did not approve of her efforts and she began again. By the following April, However, the book was being set, and on May 2, she sent back corrected proofs, and five days later signed a contract (still preserved in Lippincott’s archive) specifying that the book would appear in an edition of 500 copies, Mrs. Moore advanced $265.00 toward the cost of publication, a not unusual arrangement in 19th century American publishing practice, and was to a 25 per cent royalty on the wholesale selling price. To Mary Shoemaker, she complained, "there are so many lions in its way: the money for publication being not the least of them." The book was published by October and listed in Book News (Vol. 16, p. 52). Publication price was 90 cents. In the preface as part of the tribute and record of esteem in which her father was held, Mrs. Moore records on page 18: "Hand in hand with one or both them [i.e., Marianne and her brother Warner) had he approached the mercy-seat twice daily, and a natural sequence was it that those who should now 'lean hard' upon that Best Friend to whom he had gone, and that the little Marianne, born in his house and the apple of his eye, should pray, "Dear Lord, make our grandpa thy dearest angel. Do not let him stay sorry for us, but let him behold thy face, so that he shall be satisfied with thy likeness, and make him go up and down from heaven to earth, like those angels that Jacob saw upon the ladder." Mrs. Moore with Marianne and Warner at the Manse, Kirkwood, Missouri, c. 1894-1895. Photograph by Guerin, St. Louis. "No," I replied, "I don't think we read him very much. "But how is that? He is a very pretty poet." "Oh yes, but I don’t greatly like poetry myself,"
"Why don't you like poetry?" "You see, poetry resembles metaphysics, one does not mind one’s own, but one does not like anyone else's." MM copied the passage almost exactly, although she altered the first line, :"And you shall read Longfellow much in England?" making it: "Silvio (on Wordsworth)." The reasons are not far to seek. In the first place, no productions of the Greek genius conform more wholly to the Aristotelian canon that poetry should be an imitation of the universal. Few of the poems in the Anthology depict any ephemeral phase or fashion of opinion, like the Euphuism of the sixteenth century. All appeal to emotions which endure for all time, and which, it has been aptly said, are the true raw material of poetry. He goes on to explain that upon reading "The Anthology” the patriot will feel his blood stirred, the moralist will ponder the vanity of human wishes, and the man of the world will credit keen powers of observation. This is "the raw material of poetry in / all its rawness” which one must demand to be "interested in poetry," according to MM's renowned "Poetry” of 1919. Prince Rupert of Bavaria (1619-1682) was one of the generals of Charles I of England and noted for his scientific experiments. "'Taller by tile length of / A conversation of five hundred years than all / The others’" describes a teller of tales in the poem "In This Age of Hard Trying Nonchalance Is Good and". The source of the quotation is an unsigned piece, "Angels," in The New Statesman 5(26 June 1915), 274-275. This article concerns a tale then circulating in Europe that angels "appeared on the side of the British at the battle of Mons and struck terror into the Germans, and even into their horses." The writer gives a concise, if tongue in cheek, history of belief in fairies, angels and other spirits. He notes the dimensions of angels: "They are represented as beings of various sizes. According to a Jewish tradition, each angel is one-third of a world; but the angel Sandalfon is said to be taller than his fellows by the length of a journey of five hundred years." MM made a notation on the hack of a typescript of "Melodrama," an unpublished prose piece, writing "Taller by the length etc” and "Angels." When MM drew on this source, she replaced "journey" with "conversation" and "his fellows" with "all the others", modifications characteristic of her use of quotations. Leaps to the trajectory angle of our departure." These remarks appeal to a very definite conception of what poetry is like. A poem should offer images "by the dozen" — but certain "observations” "cannot be reproduced in poetry." Poetry thus becomes a special language with a limited vocabulary; it can make "statements of fact" only with great difficulty, for "facts" (or "statements," or both) are inimical to it. than a phrase like "Bulging outcrush into old tumult." Two things contribute to the apparent factual quality of the lines about the clock: first, the pseudo-scientific "trajectory-angle of our departure" sounds precise, although it is merely silly; second, and more important]y, this is a simple declarative sentence, which is apparently what keeps it from being "poetic": the other lines quoted do not form a grammatical sentence at all — the only verbs are participial forms standing in for adjectives, and the subject is nowhere in sight. Monro should not be too narrowly identified with the "scarecrows / Of aesthetic procedure," although his review and MM's poem, "To William Butler Yeats on Tagore," appeared on the same page of The Egoist on 1 May 1915. It seems reasonable to suppose that MM read the essay but certainty is impossible: if she ever received a copy of this issue of The Egoist, it is not in her archive. I do think, however, that MM defines herself and her work against arguments like Monro’s, which rise like "scarecrows" to define and defend the field of "correct" "aesthetic procedure" — to warn off birds foolish enough to mistake the scarecrow for the living farmer. "Diligence" may well be addressed to someone much nearer home than Harold Monro. In a conversation recorded in one of MM’s notebooks, a speaker identified as "Mole" advises someone named "Rat" to change her "style" before trying to publish a book. Taken aback, Rat exclaims, "'Huh! Then you would omit all these things I prize so much?'" and Mole replies, "'Yes, theyre ephemeral. '"3 This entry is undated, but the one following it is dated 7 October 1915, clearly too late to influence "Diligence," which was printed on 1 October; but the entries in MM's notebooks often break with chronological sequence, so this one is not completely disqualified. Evidence that such discussions occured in 1915 is valuable in any case, and the question whether or not this particular conversation sparked this particular poem is less important than the establishment of a context from which the poem derives force and significance. "Rat” and "Mole” respectively were MM's nicknames for herself and her mother,4 so the relation between Mole’s characterization of Rat’s poems as "ephemeral" and the caustic dismissal, in "Diligence,” of "man’s whim to suppose / Them ephemera" is certainly worth investigating. If the poet is arguing with her mother, the "strikingly personal" tone remarked in the query in the Spring MMN is hardly surprising. "Diligence" is a defence of MM's refusal to bring her "style" into accord with a standard of "aesthetic procedure" by which her poems are deemed merely closely-worked "curios" not worthy of preservation. The elephant, which looks as deceptively ponderous as the long lines of MM’s poems, is an apt figure for the kind of poems she believes herself to be writing. Her poems may look "more like" prose than the poems of those who respect the boundaries defined by the scarecrows; but here MM turns the tables, claiming that her poems are durable and necessary because they resemble prose, and "necessities" are "prosaic." On the other hand, poems that act the way poems "should" — poems that have the right" number of images, and do not try to reproduce observations that "cannot be reproduced in poetry" — are "ephemera" because they are not "prosaic" enough. They are the curios now. 1 MM, "Diligence Is to Magic as Progress Is to Flight," first printing: The Egoist, 2(1 October 1915), 158. 2 Harold Monro, "The Imagists Discussed," The Egoist, 2(1 May 1915). 77-80, See also Harriet Monroe, "A Symposium on Marianne Moore," Poetry, 19(January 1922), 208-16; and Louis Untermeyer, American Poetry since 1900 (New York: Henry Holt, 1923), pp. 362-58. 3 Conversation Nootbook, Rosenbach 1250/23, 17. 4 See Moore family correspondence, 1914 ff., Rosenbach Foundation. Neatness and finish, the dust out of every corner, you swish from room to room and find all perfect. The house may now be carefully wrapped in brown paper and sent to a publisher. The larger context in which this passage occurs also has some interest in connection with the lines in "An Octopus.” It is characteristic of MM to have changed the quotation from "neatness and finish" to "neatness of finish!" She had reviewed Williams' Kora in Hell for the magazine Contact in 1921, not long before the time when she wrote the poem. Writing in Informations and Documents, 1 May 1961. Kathleen Cannell reported that as a young woman, MM saw a well-known actress who wore a live chameleon pinned to her dress. Sarah Bernhardt was known to have treasured a chameleon on a chain presented to her by a Mr. Cross, a Liverpool dealer in exotic animals, in 1879 or 1880. In 1923, MM copied out the relevant passage from Sarah Bernhardt's autobiography, Ma Double Vie, published in that year, but there is no record of Miss Bernhardt’s wearing the chameleon when MM might have seen her. Which actress thus adorned might MM have seen before about 1920? Or did Sarah Bernhardt bring her chameleon, in a later version, on tour to America? "Nothing Will Cure the Sick Lion but to Eat an Ape" is noted by MM as a quotation from Thomas Carlyle's Letters. No amount of searching in Carlyle’s letters has unearthed the phrase. Does it come from another Carlyle work published before 1924? In an early MS version of "Diogenes," first published in Contemporary Verse 1(January 1916), 6, MM cites "Pandora's bees," apparently with reference to a work by Thomas Hardy, and George Bernard Shaw's "heliologies." In the context of the poem, those items should be taken into account by "a cantankerous poet" writing about 1915. MM’s notebooks and scrapbooks show that she was reading extensively about both authors in the press and that she knew their writings. Can the references be identified? Hadas, Pamela White. Marianne Moore: Poet of Affection. There is little of value here for the Marianne Moore scholar. No original material was examined in the course of writing this book, although Marianne Moore left behind an archive larger than perhaps that of any other major American writer, and this archive has been available to scholars since 1969. Necessarily, therefore, the discussions of working method, sources, associations , and verse technique rely on largely unfounded supposition and are, in fact, at nearly every important point, in error. The author adopts a style of personification and allegory, which ought to be restricted to her own creative work, and not used as a medium for criticism. Freewheeling associations link the elephant ears plant with the Republican party, the bleeding heart with bleeding heart liberalism, and "Armor’s Undermining Modesty" with advertising greed. There is no illumination here. Abbott, Craig S. Marianne Moore: A Descriptive Bibliography. Pittsburgh: Univ, of Pittsburgh Press, 1977. Expected to appear this fall, this bibliography of 265 pages excludes "only excerpts and quotations in critical studies and reprints in textbooks" and is intended to describe or list all of MM's publications, 1887-1972. Unfortunately, while it reflects the time-consuming work of compilation, it provides as much disservice as help for the scholar. The A section, separate publications, is the most carefully researched; with the aid of a collator, the compiler has apparently examined all the works on which he reports. The B section, first-appearance contributions to books, lists both first appearances and first book appearances, a confusing if accepted practice, further troubled by mistaking the two terms in 7 of 48 items. Most troubling, however, is the list of contributions to books and periodicals. Of 283 entries examined in the poetry section, errors appear in 40, or 16%; in the prose section, exclusive of Dial appearances, errors occur in 35 of 158 entries examined, or 241. The 201 Dial items fare better, with 8 errors, or 4%. Errors concern dates, volume and page numbers, titles and several mistaken identifications. Known omissions are 7 poems and 34 prose pieces. In some cases, as many as 28 reprintings are listed without indication as to whether they represent new versions or author supervised appearances. A number of important reprintings are missing. The remaining areas, briefly examined, Fables, letters, drawings, editing, recordings and translations suffer from the same deficiencies. The index contains erroneous listings and is incomplete. "Omissions are not accidents," as MM said, and a bibliographer may be forgiven certain omissions. It is certain that many new entries will appear as MM's own collection is examined. But misleading errors betray a carelessness unworthy of the subject of this work. In some cases, errors are perpetuated from the 1958 NYPL checklist; other items, correct there, have new errors. It appears that the compiler has violated the cardinal rule of bibliography; he clearly has failed to examine full copies of many of the items he lists. The partial examination by this reviewer of entries described above required approximately 150 hours. An adequate bibliography of MM’s work will take years. Hoy, Cyrus, Ed. "Marianne Moore: Letters to Hildegarde Watson (1933-1964)." University of Rochester Library Bulletin, 29(5ummer, 1976), 93-183. Excerpts from 177 letters from MM to Mrs. J. Sibley Watson. "Marianne Moore." A Little News (Friends of Central and Prospect parks, Spring, 1972). Tribute to and excerpts from conversations and letters of MM. Slotten, Ralph L. "Marianne Moore to Vernon Watkins, June 28, 1965.” John and Mary's Journal (Dickinson College), 2(Spring 1976), 4-9. 1972, 1974. Bilingual Complete Poems. Editors interpolate new explanatory material in MM's notes. Lane, Gary, ed. A Concordance to the Poems of Marianne Moore . New York: Haskell House, 1972. A concordance to the first American impression of Complete Poems (1967) with frequency table. Abbott, Craig S. "A System of Bibliographical Reference Numbering." PBSA, 69(1975), 67-74. Bar-Yaacov, Lois. "Marianne Moore: Am 'In-Patriot' ." Literary Art and~Vocation. Eds." Robert Phelps and Ruth Limmer. New Vork, McGraw-Hill, 1970. Borroff, Marie. "Dramatic Structure in the Poetry of Marianne Moore." Poetica l(Spring, 1974). Cane, Melville. "The Ladies of The Dial." American Scholar, 40 (Spring, 1971) 3'21. Driver, Clive E., and Patricia C. Willis. "Bibliographical Reference Numbering and Marianne Moore." Glatstein, Jacob. "The Poetry of Marianne Moore." Prairie Schooner, 47 (Sumjner, 1973), 133-141. Guillory, Daniel L. "Mart Crane, Marianne Moore and the Brooklyn Bridge.” Ball State University Forum, 15 (1974), 48-49. "A Place for the Genuine: The Poetics of Marianne Moore.” DAI_ 33, 1168-A (1972), Tulane. Jacobsen, Josephine. "From Anne to Marianne: Some Women in American Poetry.” Two Lectures. Washington, D.C.: Library of Congress, 1973, pp. 13-29. Kindley, Jeffrey B. "Efforts of Affection: The Poetry of Marianne Moore.” DAI 34, 7758-A - 77S9-A (1974), Columbia. Levin, Harry. Grounds for Comparison. Harvard Studies in Comparative Literature, Vol7 32. Cambridge: Harvard University Press, 1972. "Lively Lady of Letters." MD Medical News Magazine, 20 (March, 1976), 115-12I5T Biographical with pre-viously unpublished pictures of the Moores at Kirkwood, Missouri. McCormick, John. The Middle Distance: A Comparative History of American Imagination in Literature, 1919-193T7 New York: Free Press, 1971. Newlin, Margaret. '"Unhelpful Hymen!’: Marianne Moore and Hilda Doolittle,” Essays In Criticism 27(July, 1977), 216-230. "Sullivan, Maurice J., Jr. "Native Genius for Disunion: Marianne Moore's 'Spenser’s Ireland,"1 Concerning Poetry, 7(Fall, 1974), 42-47. Perkins, David. IKHistory of Modern Poetry. Cambridge: Belknap PressT 19 76, pp. 554- 5647 This survey of her career places MM among the "New York avant-garde” and points out her innovations. An admixture of insight and inaccuracy. Schulman, Grace J. "Marianne Moore: The Poet of Engagement." DAI, 33, 765-A (1972), New York University. Sta1Iknecht, Newton P. "Poetry and the Lure of the Real: Some Reflections on S. T. Coleridge, Wallace Stevens, and Marianne Moore," in Texte und Kontexte: Studien zur Deutschen und verglechenden Literatur-wissenschaft. Festschrift fur Norbert Fuerst zum 65. Geburtstag)~Bern: Franclfe. 1973.pp. 267-777. Sutton, Walter. American Free Verse; The Modern Revolution in American Poetry. New York: New Directions. 1973. Portrays conditions of M_M’s first American publication, 1915, and her disaffiliation with Poetry during its first ten years, 1912-1922. Wilson, Robert A. Marianne Moo re Serves Lunch. New York, 1976. Anecdotes fremthe author's meetfTngs with MM. Slatin, John M. "’The Savage's Romance': Marianne Moore and the Art of Poetry." Dissertation, Johns Hopkins. Lourdeaux, Stanley. "At Home with Marianne Moore: Personal Politics and the Descriptive Poet." Disser-tation, Chicago. Martin, Eileen. "Marianne Moore's Editorship of The Dial." Dissertation, Temple. This checklist represents items published from 1970 through 1976 with a few later items, culled from bibliographies and journals available to the editors (in several cases, copies of journals could not be located, hence, reliance on other bibliographies). The MMM editors will be grateful to authors who in the future can supply copies or offprints of their work for later compilations. Kest Coast students of MM will be glad to know that the Archive for New Poetry at UCSD has a substantial collection of MM materials. Michael Davidson reports that their collection includes MM's books, most with marginal corrections and inscriptions by the poet, as well as monographs, serials, and hard-to-find ephemera. George Danko explored the collection here of Leon Sorabian Herald, an Armenian emigrant poet, who corresponded with MM during The Dial years. MM took a number of Herald's pieces for tTuT magazine and reviewed his book, Land and Sea and Sky and Sun. in the July, 1926 issue TWT.TT,“5?-7IJ.HVTtTTThnTerald papers are 47 letters from MM, chiefly concerning literary matters and Herald's work. The editors of MMN will be glad to receive descriptions of MM materials in other collections. Available from the Rosenbach Foundation, 2010 DeLancey Place, Philadelphia, PA 19103, is a Christmas card with MM's first poem, "Dear St. Nicklus," 189S, in facsimile. It is imprinted inside "Seasons Greetings" and costs $.25. Much interest but no answers have been generated by the announcement in the last issue of a prize competition for the source of "imaginary gardens with real toads in them" The editors of MMN welcome discoveries. 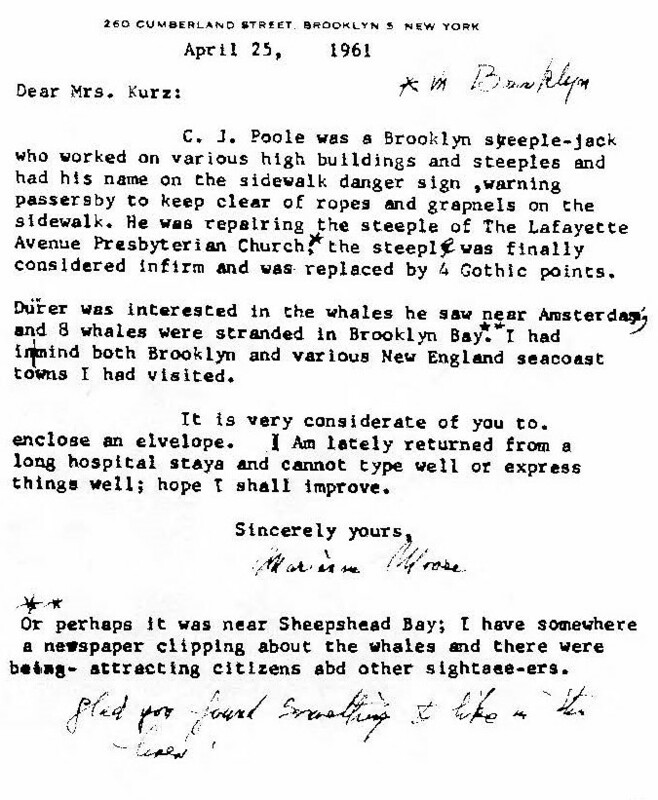 Patricia C. Willis is planning a seminar on Marianne Moore for the MLA meeting in New York in December, 1978. Seven signatures of MLA members are needed to petition MLA for programme space. If interested in helping with this project, please write to the editor of MMN before 15 January 1978.